October is National Dental Hygiene Month—a month dedicated to raising awareness to the importance of oral hygiene. As your family dentist in Friendswood, we proudly support the cause to create a lifetime of healthy smiles. Now in its seventh year, National Dental Hygiene Month was first created by the American Dental Hygienists’ Association and the Wrigley Oral Healthcare Program to start the conversation about oral hygiene. 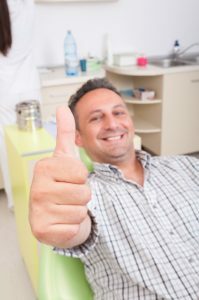 In addition to home care, it is essential you visit your dentist twice a year for a dental checkup and dental cleaning in Friendswood to ensure your smile stays healthy and beautiful. Your oral hygiene has a significant impact on your oral health, overall health, and quality of life. Your oral habits set the foundation to a healthy, confident smile. In addition, your oral habits will help to prevent certain oral complications, such as tooth decay and gum disease. By protecting your oral health, you will ensure you maintain proper oral functions to make everyday tasks like eating and speaking easier. Not to mention, your oral health is directly linked to your overall health. Without proper oral hygiene, you open the door to potentially serious health complications, such as heart disease. You have been told time and time again to brush your teeth twice a day. However, only 56 percent of women and 49 percent of men actually brush their teeth as recommend. You need to brush twice a day to remove food particles, plaque and tarter from the teeth that can lead to gum disease and tooth decay. Use a soft-bristled toothbrush to gently brush all surfaces of your teeth. In addition to brushing, you also need to floss your teeth once a day. Unfortunately, only half of adult Americans loss their teeth every day. Another 18 percent do not floss their teeth at all. Without regular flossing, plaque and tarter accumulations remain trapped between the teeth, eventually leading to gum disease. You need to floss your teeth each day to remove these accumulations to protect your smile. Your home oral hygiene is only half of preventive oral care. You need to visit your dentist twice a year for regular dental checkups and cleanings. We will thoroughly clean your teeth to remove plaque and tarter that has been left behind from brushing and flossing. In addition, we will perform an extensive examination to protect your oral health. We will provide the appropriate treatments to ensure your smile stays healthy and functions as intended. With October National Dental Hygiene Month, now is the perfect time to recommit to your oral health. At Friendswood Dental Group, we offer the tips, advice, and preventive measures you need to ensure your smile stays healthy and beautiful with the best care. If you are in need of a dental checkup and cleaning, please contact our office to schedule an appointment.